So I saw Iron Man last night at midnight, and let me just say it is by far a much better way to start off a summer movie season than Spiderman 3 was last summer. Robert Downey Jr. was made to play the role of Tony Stark, and despite how the suits don’t play a role until almost halfway through the movie, it still is easily one of the best superhero movies that has been made. There’s a great blend of action, comedy, drama and suspense, with just the right touches at just the right moments to keep you involved. And there was also a lot of cheering, because some of the effects are just downright awesome and mind-blowing. I can’t say anymore than to just go out and experience this for yourself. It’s going to be huge, and you’ll witness the first entry in what’s going to be a very fun franchise if they keep this up. Trailer note: There is an Indy 4 trailer attached to this, and yes, it is amazing, awesome, and everything I wanted it to be…..Can’t wait until an official version makes its way online! Over at /Film they’ve got a post up showcasing some early reviews of Iron Man, and most seem positive. It’s the final portion of the blog post that potentially worries me. They mention one reviewer in particular who says all the good action scenes have been shown in the trailers that have been released up to this point. He also mentions about 4 other so-called “problems”, but it’s this one that worries me the most. I always hate it when movies give away every good scene in a movie before it’s been released. I remember the most blatant example of this being back when the first Fantastic Four came out. Every trailer pretty much showcased the final battle in New York (which was about the only huge action scene in the movie). Now, I’m sure Iron Man can’t be lacking in action scenes, so I’m not as concerned, but this news is lowering my expectations a bit. Perhaps it’s the best thing for me though, because if I lower my expectations, I might not be underwhelmed when the movie opens on May 2nd. You’ll be pleased to know that the footage shown from Iron Man at Comic-Con is now online, and man does it look great….and also funny! REMOVED! It was good while it lasted…. Just found this movie poster over at The Movie Blog…. 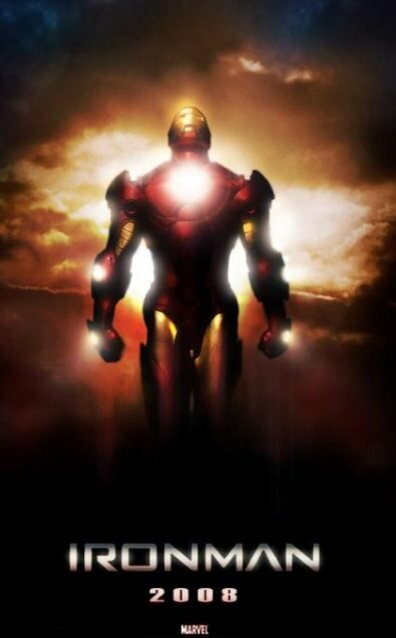 Ironman is one of the big films next summer that a lot of people are probably excited for, but may not know much about this story, or possibly didn’t even know who Iron Man was. I just remember Iron Man vaguely from TV, and also he’s popped up in some Ultimate Avengers DVDs that I’ve seen just recently. I just remember loving the colors of his suit, and the suit in general. It’s going to be cool to see it on screen.The poster below gives a nice tease of the suit, and perfectly sets the tone for the film….I can’t wait! Yes, the red and gold one! I’m psyched to see this in motion, because it turned out to look just as I thought it would….pretty darn cool! USA Today has a cool article up talking about how the role of Tony Stark in next summer’s Iron Man and how actor Robert Downey Jr., who’ll don the red and gold suit, relates to the role. It’s a pretty good article, and there’s also a nice teaser shot of Tony Stark (Downey Jr.) working on a prototype armor suit. I’m pretty excited for this one next summer, particularly because Iron Man has some of the best color combos of any of the superheroes…. 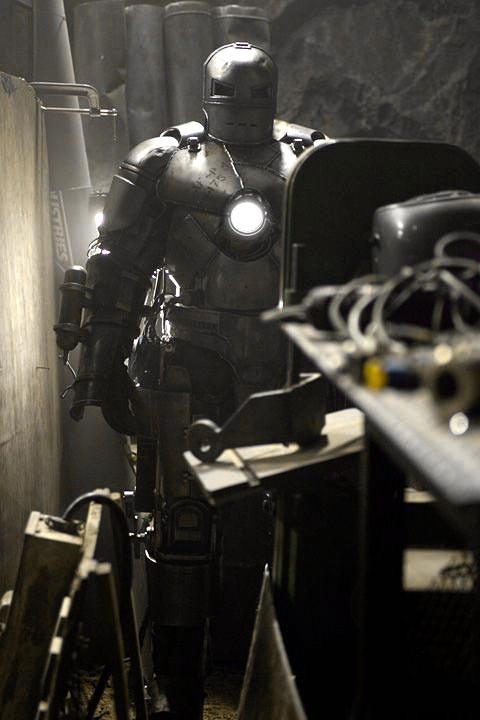 Iron Man Armor photo released! This had me excited, but then I realized it was just the first set of armor that Tony Stark makes in the upcoming Iron Man movie. It is somewhat exciting, but I’m really interested to see what they do with the actual red and yellow armor suit. This movie has potential in my book, simply based on the fact that Iron Man has some of the coolest colors of all the superheroes.